With the SuperPhillip Central Best of 2017 Awards in the books, it's time to move on to this final day of January, where I have two reviews in store. The first is from Rain Games, makers of Teslagrad. 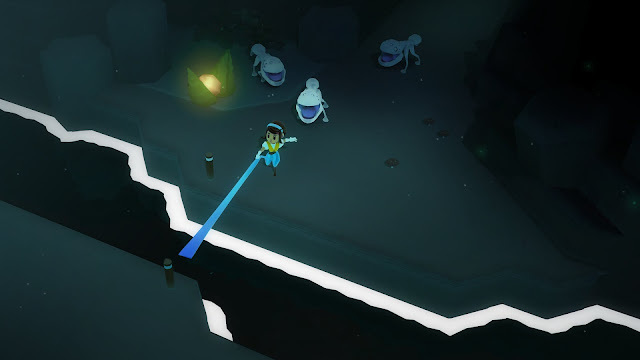 The team's game is World to the West, recently released on the Nintendo Switch, which just so happens to be the platform I reviewed the game on. Not the best in the West, but genuinely enjoyable all the same. Two popular genres from indie studios seem to be the 2D platformer and the Zelda-style action game. Developer Rain Games already created the former with Teslagrad, which released several years ago. Now, the developer is focusing on the latter genre experience with World to the West, which combines the typical gameplay of a 2D Zelda and merges it with a chapter-based structure. As one might imagine with a game of this type, there are plenty of enemies to defeat, puzzles to solve, and areas of the world to explore. Square key for a square door. This beginning puzzle is certainly no brain buster. What makes World to the West unique is that you aren't just exploring the world with one character. Instead, you accomplish this with a cast of four interchangeable characters, each with their own distinct move set and abilities. The teslamancer (explained in Rain Games' first effort, Teslagrad, as a term for people who can summon the power of lightning), Lumina, can fire bolts of electricity from her fingers and teleport small distances. Teri has the ability to control the minds of enemies, using their abilities to progress, as well as having a whip to pull herself across specific gaps. Meanwhile, Knaus is a precocious and pleasant, young lad who can climb into small holes, dig underground, and later in the game, even ice skate across bodies of water. Finally, Lord Clonington has massive strength, able to climb up short walls and break down iron-gated doors in no sweat. With a sling of her whip, Teri makes a quick, and dare I say "fashionable," escape. With the chapter-based system, you start out in World to the West only being able to control one or two characters at a time. By the midway point of the game, all four heroes meet up, allowing full control of each character. However, there are positives and negatives about this. For a negative, switching between characters can be a headache, as characters can only be switched in and out at save totems, rather than changed at the player's leisure. This makes sense as World to the West's map is crafted in a way that puts each character's abilities to good use. While Knaus can skid across lakes to progress to one area, Lord Clonington can bash down a door blocking his way to that same area. This is to say that although players might find themselves needing to get to the same destination with all four characters at times, it's made less strenuous by having them reach that destination through different means, and potentially totally different pathways. When situations call for some brawn, Lord Clonington is at your service. I understand the need for the game's world to be built this way, too. Certain secrets within the world, the two most prominent being extra health and batteries, are meant for specific characters to nab them using their own special and unique abilities. If one could simply switch at any time between characters, the balance would be jumbled up. A player could easily reach secrets otherwise, and that kind of "switch on the fly between characters" gameplay would require the developer of World to the West to seriously revamp and rebuild the entire world map, possibly ruining their vision. Still, some sort of solution in the middle would have been lovely to see. Gather 'round the campfire and hear a tale of an unlikely team of heroes. While that does adversely affect the more open-world portions of World to the West, switching between characters in the way World to the West handles it works best in the more linear areas of the game, such as the two late-game dungeons requiring all four characters' abilities. The puzzles become clearer on what needs to be done, and you don't need to bring a character over from who-knows-where in the open-world map to perform one odd action just to continue with a given puzzle. That notwithstanding, the requirement to switch between characters and essentially lead them one-by-one from totem to totem allows players to learn the map better and find those aforementioned secrets more easily (and get by help the proper character to solve the puzzle(s) needed to grab them). As you can see, there are many positives and negatives that go into making World to the West both fun and rewarding as well as occasionally laborious and evoking a sense of repetition. Thinking of that, World to the West still managed to provide me ten hours of joy and satisfaction in figuring out ways to get around the world with each character, solving puzzles, and discovering secrets. 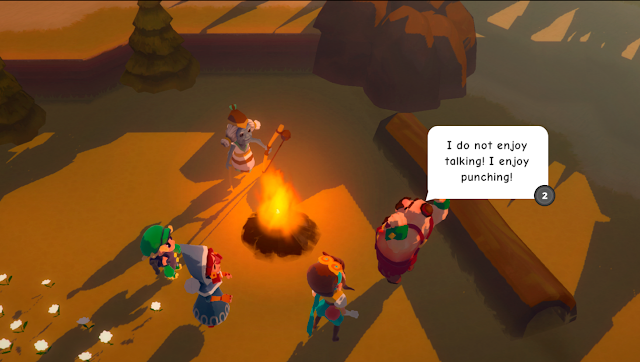 World to the West may not win everyone over with its character switching approach, but it should win most of them. Review code provided by Rain Games.